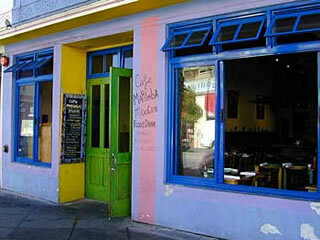 Jayne's Sopa Azteca is inspired her days at legendary chef Reed Hearon's Café Marimba on Chesnut St. in San Francisco. Jayne was server nonpareil and expert at fending off the advances of cheeky regular Don Johnson, who practically lived at Marimba during the run of Nash Bridges. Sopa Azteca (Aztec Soup) is a tomato-based soup made with Pasilla and Guajillo chiles and slowly braised pulled chicken, garnished with queso fresco, tortilla strips, Mexican oregano, and plump ripe avocado. Just smelling its warm aromas from the kitchen this afternoon, this comfort-food soup brought back memories of carefree college days during the dot com boom.